THERE is nothing quite like it: to see the fruits of one’s labour ripening – construction taking shape. 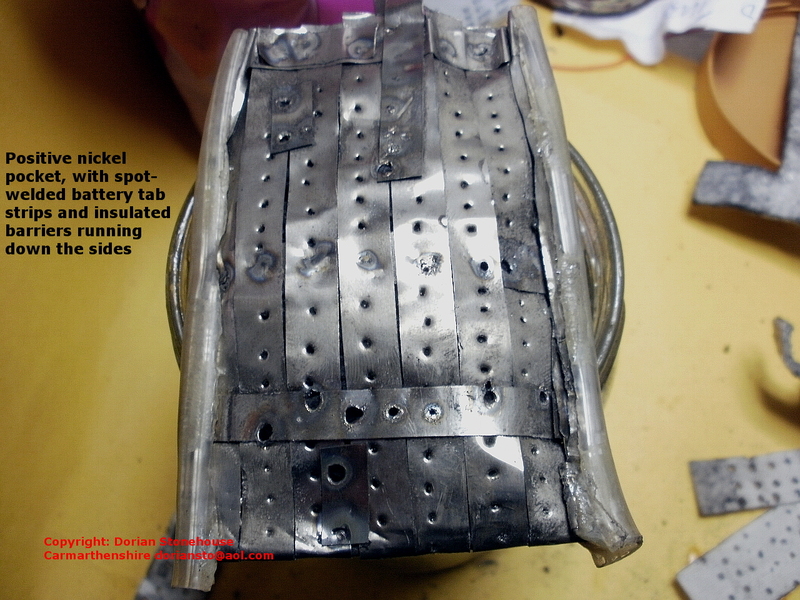 So here is a homemade Edison Nickel Iron battery under construction – one cell at a time ⇓⇓. 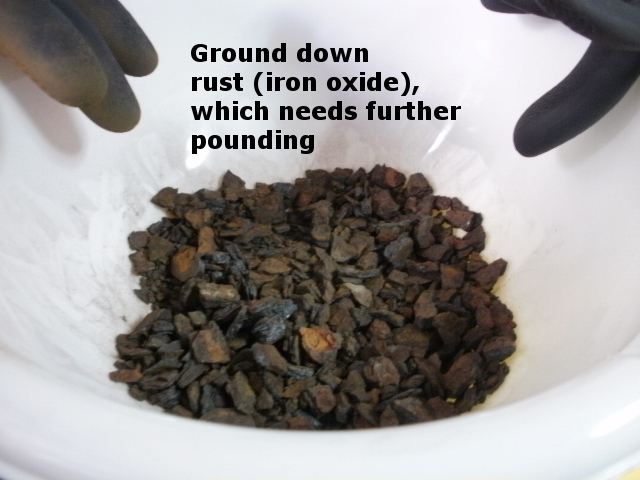 The correct way to construct a Ni-Fe battery is to use a thin coating of black Iron Oxide for the negative plate; but that stuff is just too messy to use. 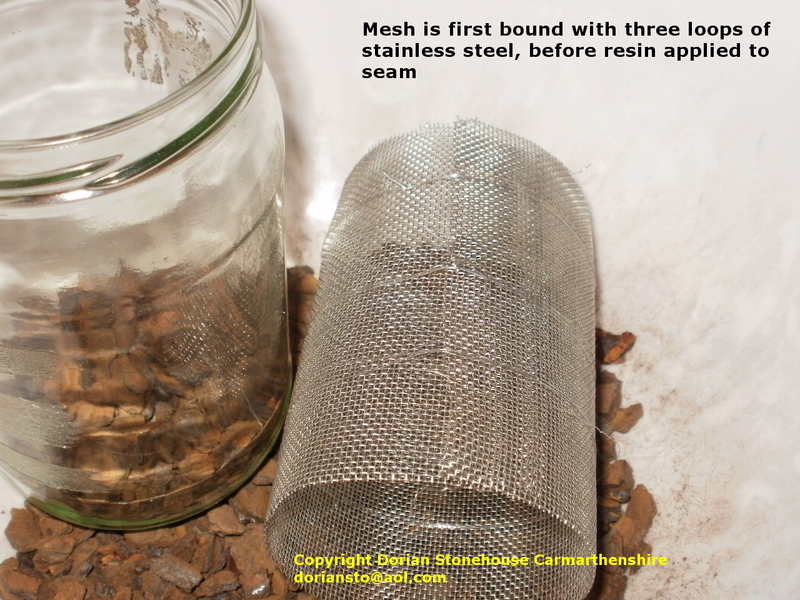 So, for the negative terminal I will be using (cleaner) brown rust from an old quarry, which will be thinly deposited between two layers of 20 mesh wire gauze⇓⇓. So it’s off to the quarry to get that rust. 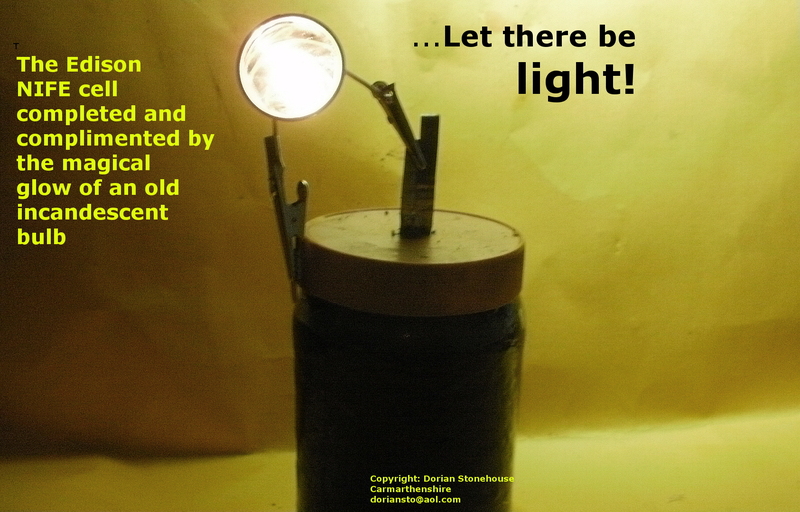 In the meantime, the positive terminal of the homemade Edison cell can be constructed, and this is how I did it⇓⇓. The Nickel Hydroxide was a bit of a challenge to source, so to get the nickel, I dissected several dead AA Nickel Metal Hydride cells. 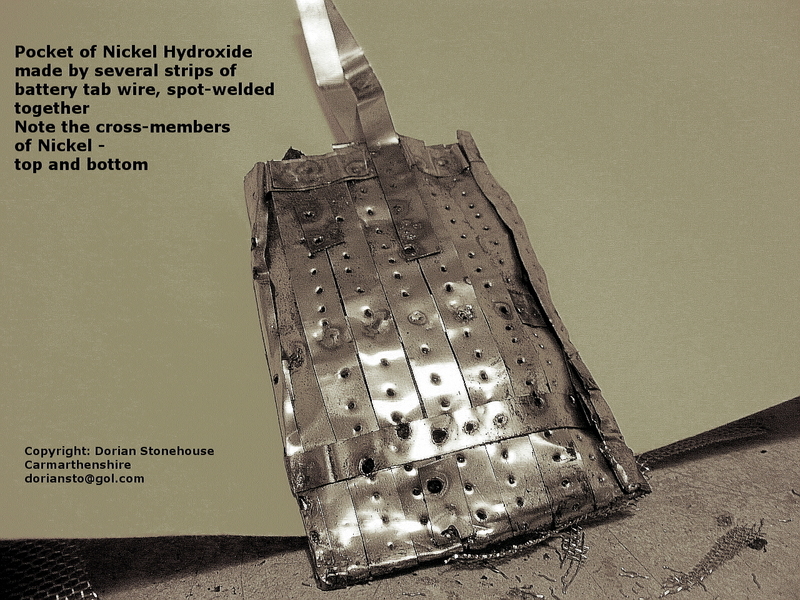 Nickel harvesting is dangerous, because the Metal Hydride part of the cell is exothermic (it can burn in air). 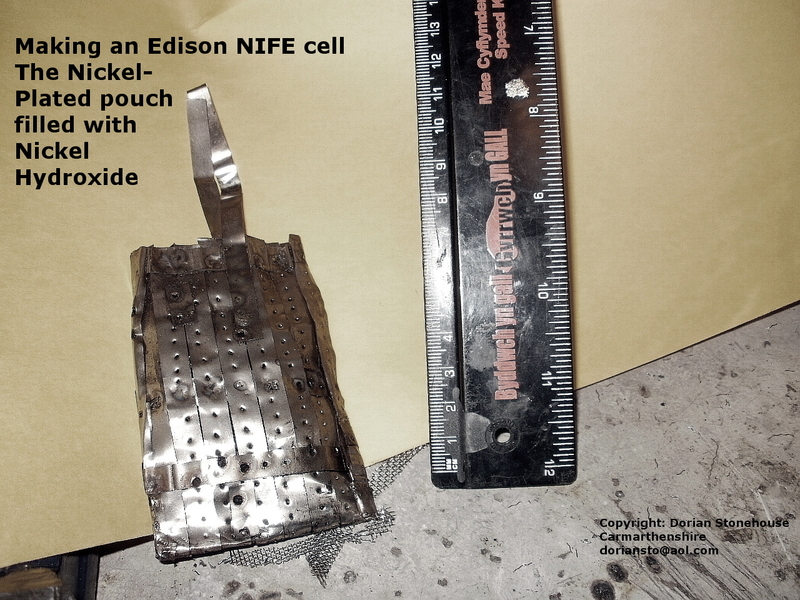 The first time I attempted to harvest the Nickel Hydroxide for my homemade Edison cell, the AA cell started burning and I lost the lot! 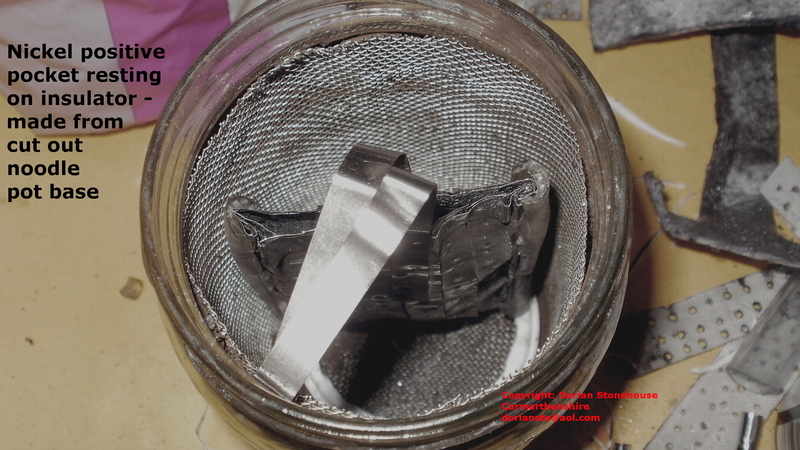 After sizing up the mesh, the first layer was ⇑⇑ used to reinforce the inside wall of the glass jar and to improve conductivity. 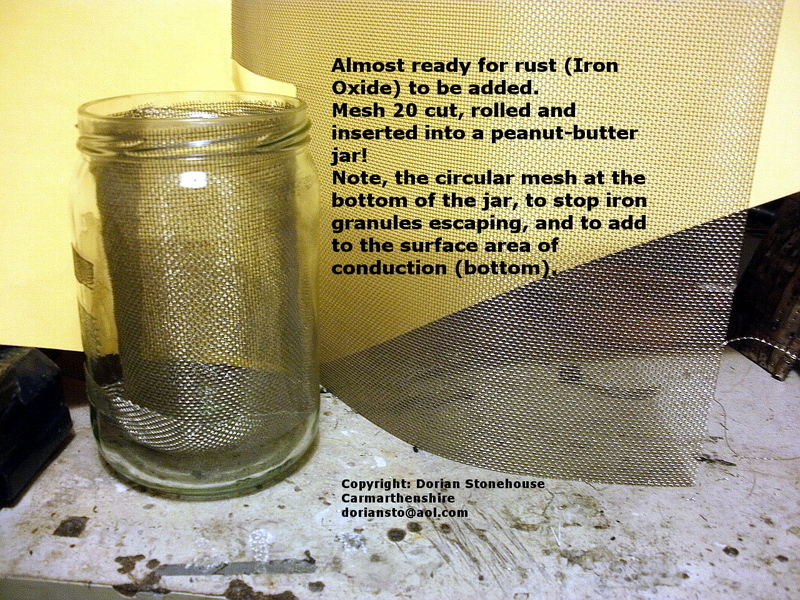 I inserted the next mesh layer, ⇑⇑ before filling up the space in between with powdered iron oxide. 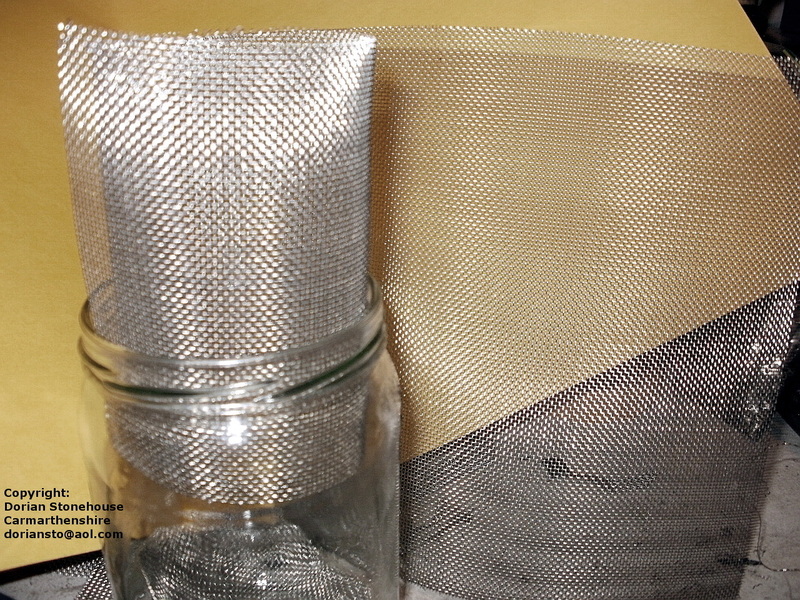 The negative terminal is made from battery tab nickel strip, which is forced down between the mesh layers. 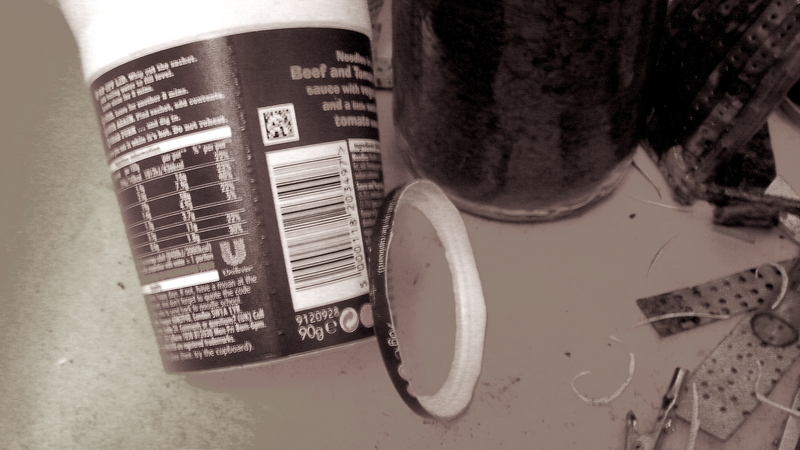 The base insulator is made from the base of a pot noodle pot, and ⇑⇑is pushed down at the bottom of the cell; providing good insulation for the positive pocket. 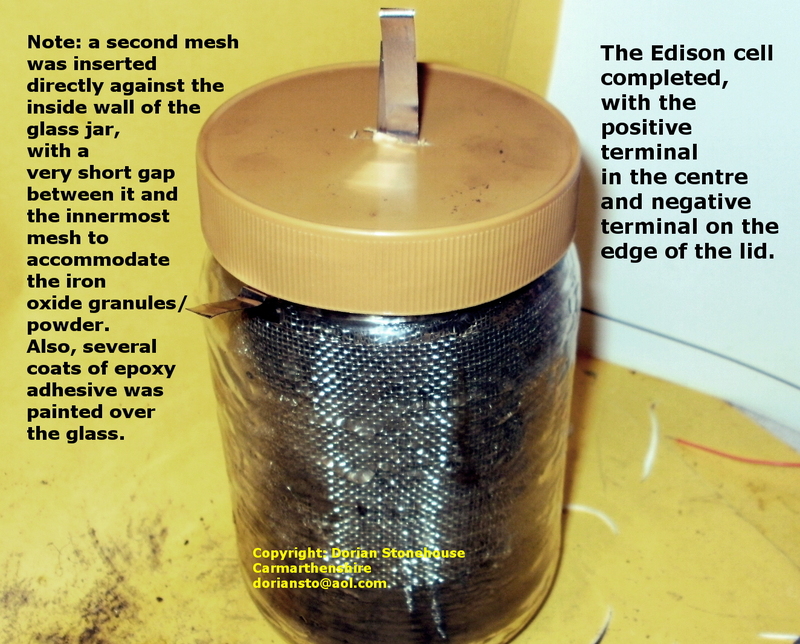 I insulated the sides of the positive pocket ⇑⇑, to prevent it from short-circuiting to the negatively polarised mesh. A plastic pipe slit down the sides and glued on using alkali resistant epoxy adhesive does this job very well. 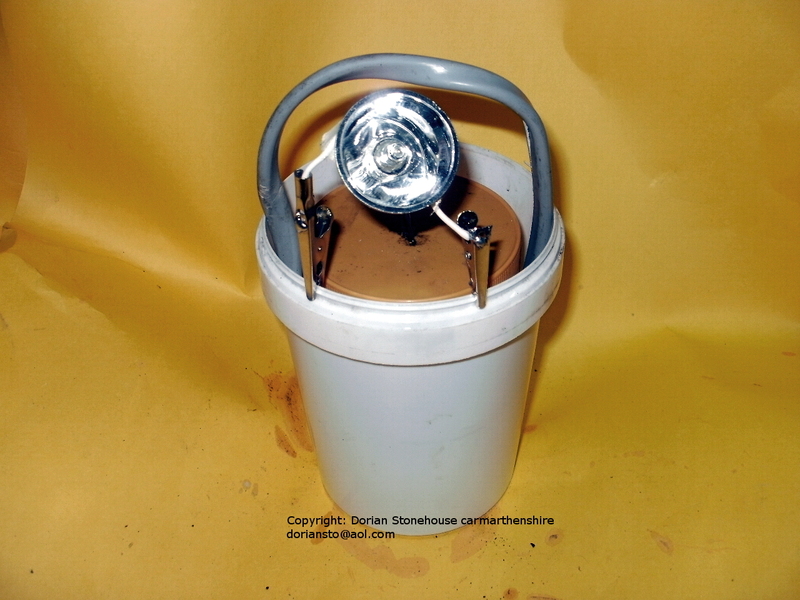 Final check: the positive pocket is inserted on top of the insulator. 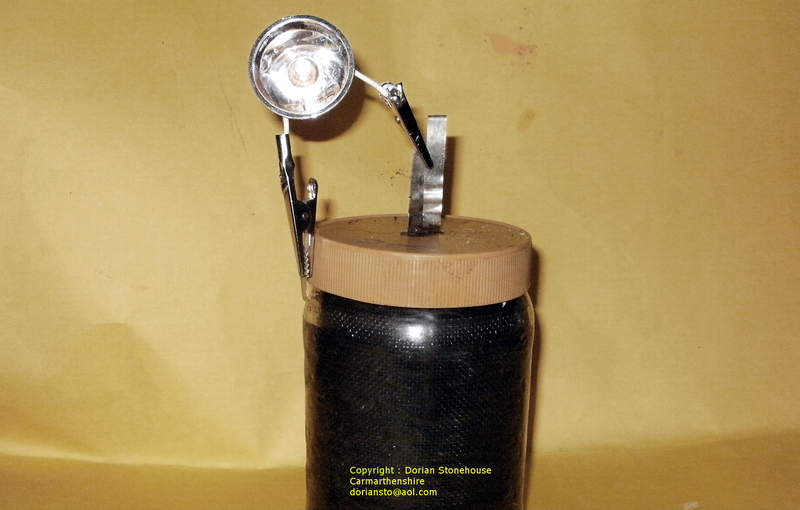 Ingredients: deionised water, potassium hydroxide (caustic potash), alkali-proof container, alkali resistant spoon and car battery hydrometer. 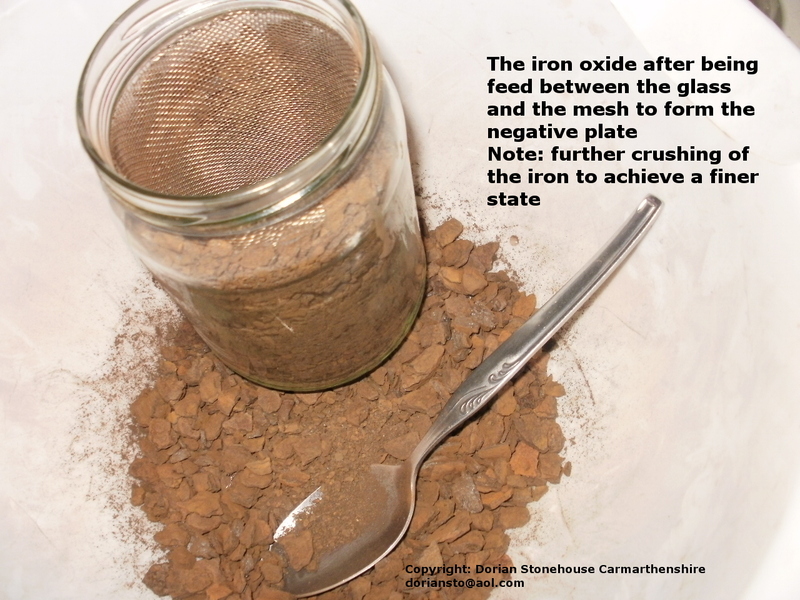 Method: Carefully add a sprinkle at a time of potassium hydroxide (chemical symbol KOH) to the deionised water and stir in with a tablespoon. 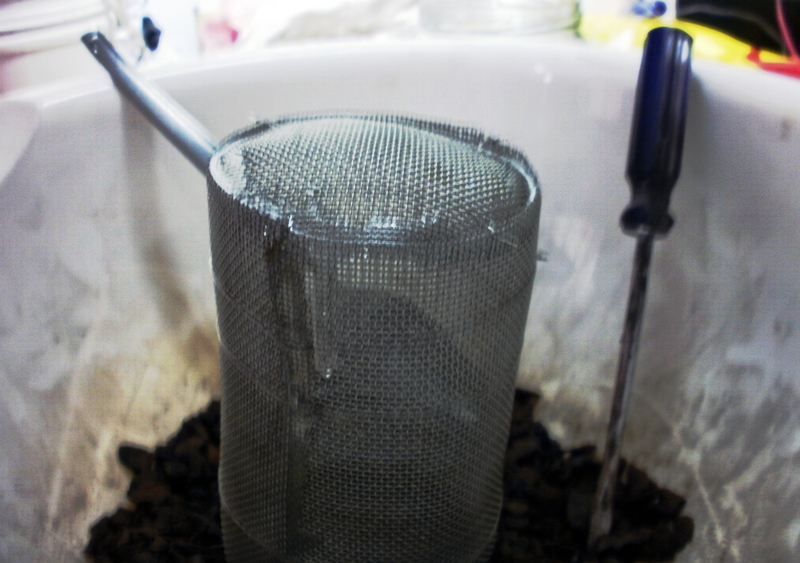 The solution gets quite hot, but I kept stirring in a little more KOH to the solution, until the electrolyte reached a specific gravity about 1:25. 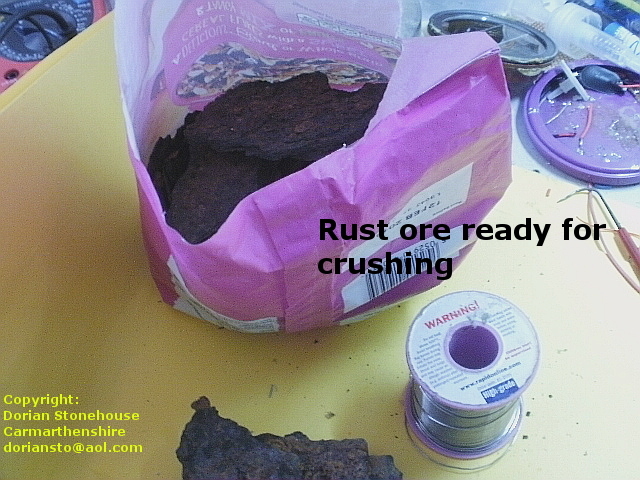 This action can be dangerous due to spillage, so gloves and face protection are must haves! To charge the cell: I use a variac transformer, with its ac output connected to the mains input of an ordinary car battery charger⇑⇑. Safety notice: Variac’s are not usually isolated, so I always connect an isolating transformer between it and the raw mains, to avoid a (potentially) lethal electric shock. The ideal situation is to adjust the charging voltage to just over 1.69 volts per cell, which should equate to a current of about 2 amps for this particular cell. 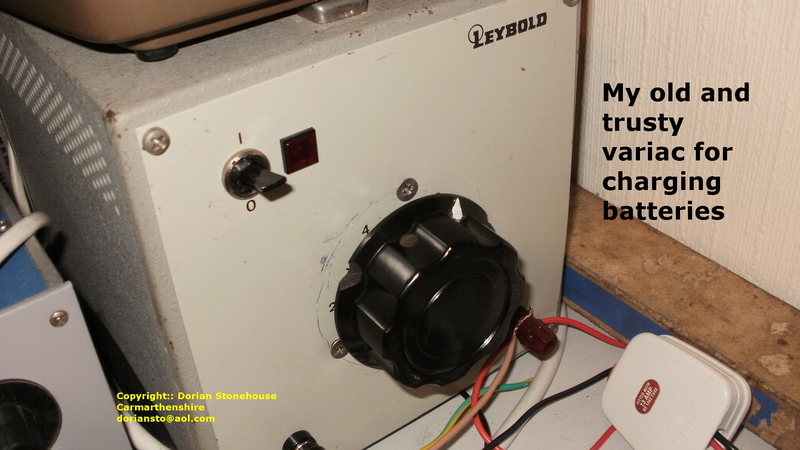 As the current falls, the voltage will rise, so the voltage has to be reduced again to just over 1.69 volts. I turned the voltage up sufficiently to get a higher current of about 4 amps to flow. 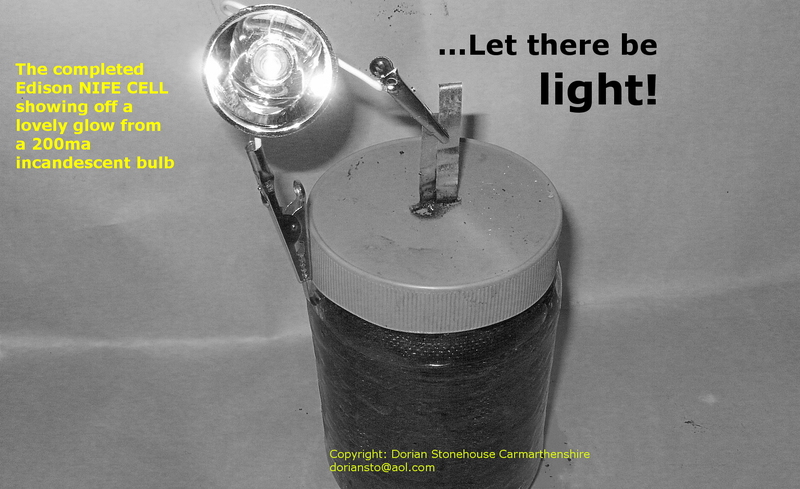 This is the only way to get the juices going – to get the cell fizzing away nicely. 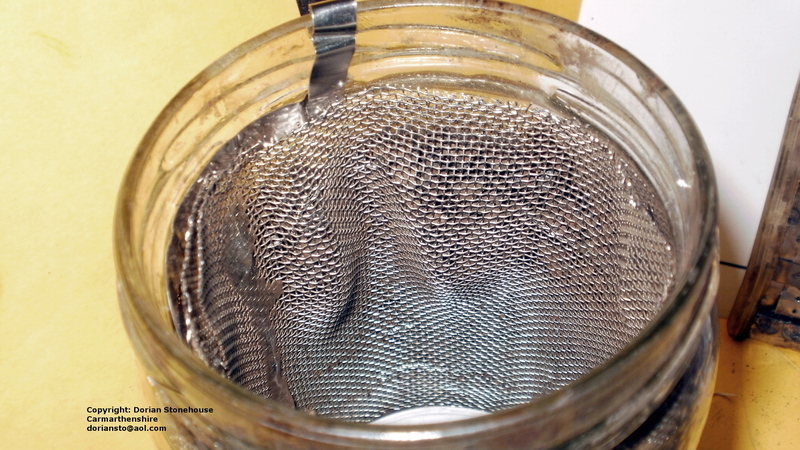 Note: The current must not be too high, or the electrolyte will “boil” and spill over the sides of the jar! Come in number one, your times up! It normally takes a minimum of 24 hours to charge a new cell. The current should then be as low as it is going to get. When disconnected, the voltage across my cell started to fall to around 1.45 volts, eventually reaching a little above 1.4 at around 1.42 volts. At 1.4volts the battery is still fully charged.